Joker 8000 is probably one of the most popular classic slots coming from Microgaming. Before modern video slot games took over the casinos classic slots were the way to go. The game features an improved 5 payline design with bonus spins and mystery prizes which can go up to 8000x stake. 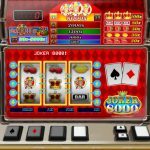 The big payout potential of the slot is the main reason why Joker 8000 is still a very popular slot across Microgaming casinos. 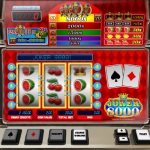 Joker 8000 has a classic slot machine design with regular payouts and Super Bonus Game payouts. During base play you will need to land three matching symbols on a winning pay line in order to form a winning combination. The maximum payout during base play in the slot is set at 100 x stake. Once a win is formed you can choose to collect your winnings or set them aside and play the Super Bonus Game. In the Super Bonus Game each spin is played at a fixed rate of 20 Super Credits. As you get winning combinations you can choose to continue to play or collect your winnings. The whole point of the Super Bonus Game is very simple. Each time you land 2 or 3 Joker symbols on the reels they will award a mystery prize. The mystery prize can range anywhere from 20 to 8.000 x stake. This is why you need to play as many Super Spins as possible in order to increase your odds in landing the maximum payout. 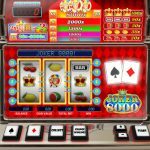 Joker 8000 is an interesting Microgaming slot despite the classic slot design. The game has a big payout potential of up to 8000x stake which is reason enough to give the slot a try for real play at any of our recommended Microgaming casinos. If you love Halloween then you should consider playing Alaxe In Zombieland a 5 reel slot by MicroGaming.